Follow these five principles to save for a successful retirement. Saving for retirement can be stressful. It’s like running a long-distance race without knowing how far you have to run. Mile-marker after mile-marker, you wonder when you’ll finish. Are you running fast enough to win? Are you running so fast that you’ll exhaust yourself before reaching the finish line? Striking the right balance between living a comfortable lifestyle in retirement and saving for a long enough retirement is a challenge. How can you know how much you’ll need to retire when you don’t know how many years retirement will last? How do you balance today’s needs with an unknown future? The most important part of saving for retirement is simply to begin. Follow these five principles to get started on your path to a successful retirement. When evaluating how much you need to retire, think in terms of your current income instead of an overall dollar amount. 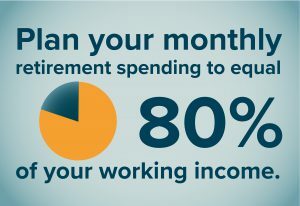 If you want to maintain your current lifestyle throughout retirement, your monthly income from sources like Social Security, pension, and savings withdrawals will need to add up to 80% of your working income. Whatever dollar amount you currently think you’ll need at retirement, it’s probably not enough. Why? Because it’s important to take inflation into account. It’s not enough to think of the dollar amount you need each year and multiply it out for thirty years because living will get more expensive over time. To protect your retirement, assume a 3% annual rate of inflation. If you think you’ll need $1 million to retire, you’ll actually need closer to $2 million to account for the increased cost of goods and services over time. The median life expectancy in the U.S. is 78.6 years (Kochanek KD, 2017). If you’re married, there’s a 45% chance one of you will live to 90 (Retirement Plans Experience Committee, 2014). With such long life expectancies, it’s more important than ever to plan for retirement early and prepare for a long retirement. Following the 4% rule will ensure that your nest egg will last. 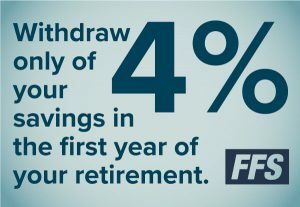 If you withdraw only 4% of your savings in the first year of your retirement, and adjust that amount each year to account for inflation, your savings should last about 30 years. If you retire at 67, the 4% rule will fund you well into your nineties. Coupled with the 80% rule, you are well on your way to preparing for a comfortable and long retirement. To reduce pressure on your retirement savings, plan to be debt-free when you leave the working world behind. Imagine how much more money you’ll have each month if you don’t have to worry about a mortgage, car payments, credit card debt or student loans. If things get tight when you retire, you can downsize, cut expenses and live more modestly, but you won’t be able to lessen payments on your debts without increased income. Create a plan with your financial advisor to be debt-free before retirement to lessen the burden on your retirement accounts. Following the four principles above ensures that you’ll be prepared for a comfortable retirement, but those funds can dwindle quickly if tragedy strikes. If you face a chronic or critical condition during your retirement, you may not have the funds to cope with medical bills and keep up your standard of living. Disability can limit your mobility and require long-term care that gets expensive quickly. Protecting your retirement investment means preparing for the unexpected. A life insurance policy that offers living benefits can offset the costs of care while you’re alive so that you can maintain your quality of life. If thinking about retirement savings is stressful, you’re not alone. But it doesn’t have to be overwhelming. The first step to creating a workable savings plan is to understand exactly how much you’ll need in savings when the time comes.